There’s stuff I’m doing in-game for Southern Reaches that does not appear in the adventure logs. Some of it is does not appear as it is “sekret stufs” and not all the players know it (yet). Some is because I’m not certain how to present it. This post covers that latter category. For example: the adventurers have been approached by a representative of the Baron, asking what their intentions are for Drop-off Tower. This conversation was partially in-character, but mostly out-of-character after one of the game sessions. The adventurers are becoming “people of note” in the Keep. They regularly go out into the wilderness and usually come back with loot of one sort or another. They have cleared a path through the Edgewood Forest to places unknown. They have several times headed out on that path with reinforced doors and once a masterwork ballista. They were clearly fortifying a location without hiding that fact, so eventually the Baron was bound to find out. Clearly he would send a minion of some sort to find out what the adventurers were up to. What I didn’t know was how the players (not the characters) would react to the local authority enforcing his rights of dominion. I didn’t want it to be a big deal, as the point of a West Marches campaign is that adventure happens “out there”, never at town. So we kind of talked through it a bit after a game session. I made the point that, while this is a wilderness, there are some strictures about what happens if the PCs start challenging the local authority. I also got across that recognizing the authority that the Baron would not be a big deal in game. However, since it only quasi-happened in-game, I did not mention it in the adventure log for that session. The players and I also discussed what it would take to make Drop-off Tower a place where the adventurers could end a session safely. This mostly required upgrading the tower so that staying there was not the functional equivalent to camping. This led to the hiring of contractors to do repairs and upgrades to the tower (as related in my last post). In addition to the upgrades to the tower, the PCs also received a document of title to the tower from the Baron. This basically says that the PCs have ownership of the tower but also recognize the Baron as their local sovereign. Again, something handled mostly off-stage, so I did not chronicle it in the adventure log. Granting of the title is important for things happening behind the scenes and waaaay off stage. The players have expressed an interest in finding/contacting other settlements, mostly to find a way around the 40% mark-up the Baron places on all goods and services in the Iron Keep (it is a company town after all). In the coming months, a new colony will be established on the coast, introducing a potential new rest area and people for the PCs to interact with, allowing use of their barely touched diplomacy skills, plus making it easier to explore areas off the current map. The Baron knows this is coming and needs vassals on paper to maintain control over as much territory as he can get his hands on. This is what he gets for granting the adventurers title to the tower. The Woodcutter’s Camp and the adventurers of Drop-off Tower will allow the Baron to claim control over the entire Edgewood (or so he hopes) in addition to his solid claim to the Iron Hills. The Baron may also be able to claim control over Three Peaks Hills, but that might be a stretch. With another settlement in the known lands, one he does not have immediate control over, the Baron needs to start putting down stakes, even if it means granting a little more autonomy than he'd like. Now none of this should directly involve the PCs. This should be more like emptied adventure locales being restocked as new creatures show up and take residence. Things will change in the background and may change some party behaviors (like where they go to sell loot or buy supplies), but there should be no adventure tied to these changes, otherwise the campaign type has changed to a more standard one and I (and the players) don't want that for this campaign. That’s it for now – later! This session happened Friday, October 22, 2010, and was the only session I ran this past weekend. This was a relatively short session adventuring-wise as the players spent time (and gold) upgrading Drop-off Tower to be a place they could rest at, avoiding the necessity of returning all the way to the Iron Keep every time. The adventurers took a month off from adventuring. Sal took the time to craft a number of magical items for the group, which kept him busy for most of that time. What time he didn't spend creating magic items, he spent searching around the Iron Keep for any that might be available for sale, particularly scrolls of spells he did not know. While Sal was busy with that, Agnes and Tycho contracted skilled craftsmen to improve Drop-off Tower, making it usable as a base of operations. They had iron stoves installed, the water damage on the fourth floor was repaired, a new roof was added, and all the windows were shuttered with heavy wooden shutters. The interior was also fixed up, rough furniture assembled, and the old back door was replaced with a new, brass-bound door. All the timber used came from the surrounding trees, which were cleared out to 50 feet. Two guards and two caretakers were also hired and established on site. Thorngrim spent the time training his and Su Bel's dogs new commands. He was mostly successful. At the beginning of the new year (the following month), the adventurers were ready to return to the morlock area under the tower. Returning to the hallway the last of the morlocks fled down, the adventurers entered the last door they listened at. Beyond it was a relatively small room the morlocks used as a guard post. While checking the room, a secret door was found. The secret door led to a series of chambers, also linked by secret doors. The rooms were dedicated to the worship of the Forbidden God, a deity of evil reputation, almost lost to time, each room covered with murals showing acts of violence and madness. The final chamber included a faceless statue of the Forbidden God, along with golden altar accoutrements. Sal viewed the room with detect magic. While nothing detected as magic, Sal may have seen more than he wanted. Despite the high gold content of the room, the adventures left every alone, touching none of it. Somewhat unnerved by the palpable evil radiated by the chamber, the adventurers backtracked to doors near the original morlock guard room. They found the doors led to hurriedly abandoned rooms once occupied by morlocks. In what may have been the leader's room, another secret door was discovered, beyond which was a treasure chamber. This chamber was heavily dust-coated, suggesting that the morlocks had never found this chamber. Inside the adventurers found three chests. Su Bel cast detect traps, identifying all three chests as trapped (which led to Agnes wondering out loud why Su Bel hadn’t been doing that much earlier). Agnes investigated the chests and determined that all three were triggers for a room-wide electrified floor trap. She carefully disarmed that trap. Mog then carried two of the chests safely out of the room. With only one chest at risk, Agnes then disarmed the trap in the remaining chest. Inside was a bag of gold coins of elven minting. The disarming process was repeated and a sack containing four items was found. The third chest was brought in for disarming and turned out to be nothing but one big trap, unleashing a hail of arrows. Agnes was able to flip up over the chest and out of the arc of fire while the rest of the group (safely in the previous room) heard the clatter of tens of arrows striking the far wall. Agnes decided to pack up the trapped chest into one of the groups bags of holding, seeing no reason to leave behind such excellent workmanship. Having expended the possibilities of this chamber, the adventurers pressed on down the hall to a large, square room containing a 20-foot square obsidian cube surrounded by 20 inanimate skeletons. Sensing danger and a mystery, the adventurers cautiously moved around the cube, being careful to not touch anything. After finding nothing but the cube, the skeletons, and a door on the far wall, the adventurers started discussing what the obsidian cube might be. Sal suggested that it might activate if touched or struck, to which Mog replied, “Like this?” Mog then threw a javelin at the cube. The surface of the cube was solid, but a wave of sparks rippled out from where the javelin struck it, seemingly just under the surface of the stone. The skeletons immediately animated and attacked. The ensuing fight could have been dire, as the adventurers were unprepared for so many foes, but Su Bel called upon the guiding light of her deity and a wave of pure light radiated out from her, shattering almost all of the skeletons into fiery shards. After that it was minor mop-up duty to eliminate the last two skeletons. Words were then said to Mog. Stern words. A more thorough search of the room unearthed an additional exit from this chamber in the form of a secret door. The adventurers chose to explore beyond the secret door first, finding an extensive library of books. The room appeared to have been undisturbed for a very long time. Having noticed a pattern of secret rooms having additional secret doors, the walls were searched and another secret door was discovered. This secret door led to another altar to the Forbidden God. In the center of the room was a statue with an altar in front of it. 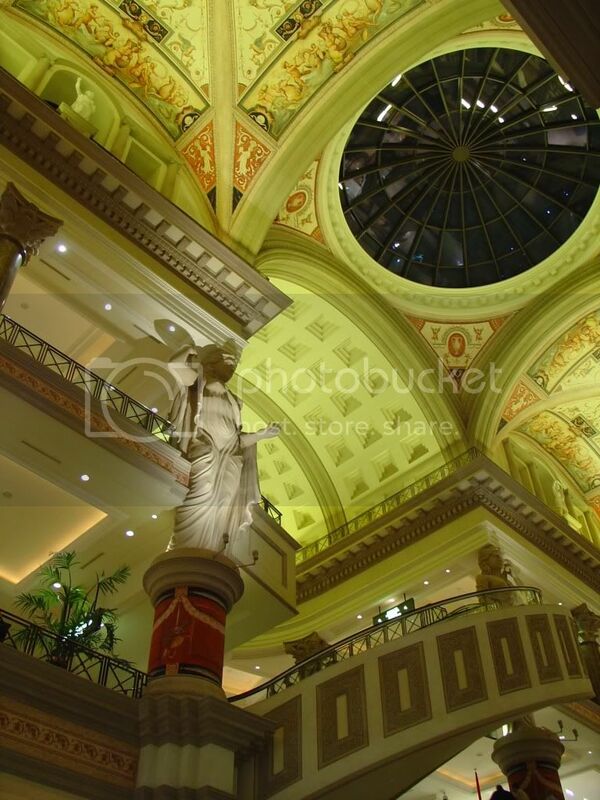 The statues arms were upraised to the ceiling, its hands thrust into a blood pool which was covered the ceiling! The adventurers quickly decided that they wanted nothing to do with this room and closed the door. Returning to the obsidian cube room, the adventurers moved through the remaining door, discovering a passage way that led east down into a tunnel of unknown length and west to another door on the opposite side of the hallway. The adventurers explored through the door and found a final morlock guard post. It showed signs of now being abandoned and they found no secret doors. This session happened Wednesday, October 13, 2010. Having learned much and gained vital gear at The Library, it was now time to deal with the goblins and Gil’s missing pony. Most of us were certain that the pony was dead and eaten by the goblins, making this a reprisal rather than a rescue. We were all good with that. Our base plan was to fly over the fort, Gil would lay down a barrage of fireballs, I’d swoop in and drop the fire elemental to rampage, and then the rest of us would attack any goblins still standing. A very basic plan, but with no map and days since the others were last there, it was the best we could make until we got there and scouted the area a bit. Along the way to the goblin fort, we ran across The Hunter, relaxing and having a smoke break. We discussed what was about to happen and asked him what he knew of the area. Apparently, the goblins had been very busy over the last several days, pulling in patrols and setting out guard posts. Additionally, the goblins were allied with the lizardmen in the hills to the west and had called in a favor, so there were lizardmen at the fort now. Next, the goblin healer was not the leader but the second in command. The actual leader was a goblin wizard. Finally, the goblins and the lizardmen kept the undead population down in the area, so if they were completely eliminated, the number of undead would go up. We asked The Hunter if he was interested in joining our plan of action and he agreed with the proviso that we needed to provide him with a way out as we did not have enough flight spells. I agreed to this, thinking I could use elemental body to turn him into an earth elemental and he could earth glide away. Being a wizard is terribly handy. I wish I’d thought to do some studying earlier in my life. Ah, well. As we got closer to the fort, we discovered two sets of goblin scouts and dispatched both groups before word of our arrival could be given. That was the last of the good news for a while. When we reached sight of the fort, we discovered that the fort was now ringed with 15-20 lizardmen and two sleeping giants. Actual giants! Needless to say, this led to another revision of the plan. Now, after Gill hit the inside of the fort with two fireballs, I would fly down and plant the tree feather token to block the gates. This should keep the lizardmen out of the fight until the giants awoke, after that - all bets were off. The Hunter volunteered he had a way to keep the giants busy for a while, but it meant he would not be involved with the fighting inside the fort. We decided that anything that kept the giants off our backs was a good thing. We stationed Jonathan back away from the fort, to keep him safe. We would need to fly out to him for any healing greater than our cure light wounds potions could grant, but it would keep him safe as we did not have enough flying or invisibility as it was. We put together a banner pole for him so we could find him. The minimal risk of the enemy spotting him would be significantly reduced, if not eliminated, by our flashy aerial assault. As ready as we could be, Gil turned us invisible and granted us flight, then drank our only potion of stoneskin. [NOTE: the DM gave us this as a magic item before realizing that it was illegal to make stoneskin into a potion. We had been hording it ever since.] We kept close via holding onto each other until we were above the fort and could see in. Here we got our last piece of bad news. The goblins had a pair of ettins guarding the leader’s house. A pair of ettins! Goblins plus lizardmen plus TWO giants plus TWO ettins was starting to be a daunting task. Oh, plus the goblin healer was riding a worg, not a “large wolf” as Gil stated when he first told me about the goblins, a worg. At this point I was starting to suspect that we would not achieve our goal of killing all the goblins. After some quick whispering to direct where Gil’s fireballs needed to land and confirming that if nothing else, we needed to take out the healer, we moved into position for the assault. Gil started raining fireballs on the goblins (plus the linked scorching ray and magic missile, which targeted the healer specifically) while I cast enlarge person on Arthus so he could dance with the ettins. This was a good thing because after the first fireball, Gil was visible and the ettins targeted him with their javelins. If not for the stoneskin potion Gil would have died right there. Gil’s second fireball (plus linked spells) cleared the inner fort of most of the grunt goblins and set the tents on fire, allowing me to fly in completely unobserved and plant the feather token by the gates, blocking the gates from opening with a sudden 60-foot oak tree. At the same time, Arthus attacked one of the ettins, drawing its attention from Gil, while Artemis started clearing the walls of archers. Outside the walls, an elephant and a griffin suddenly appeared and charged the two sleeping giants, keeping them occupied and mostly pinned in place. The lizardmen rallied, but did not attack. The leader of the goblins and his two bodyguards charged out of his burning house and started shouting orders. The ettins concentrated on attacking Arthus, hitting him multiple times and forcing him to retreat to Jonathan for healing. I crushed the fire elemental gem, releasing the fire elemental inside, and ordered it to attack the goblin leader. As I was still invisible, this attack came as a surprise to the goblin leader. Gil continued to rain down his fireball/scorching ray/magic missile combo, eventually taking out the goblin healer, but not his worg mount, which picked up the body and fled. In the meantime, with a large fire elemental fighting the goblin leader and fireballs raining from the sky, the ettins apparently decided that they had had enough and fled, one making it over the walls and running while the other sat on the wall and waited to see what happened next. The lizardmen also surrendered at this point. I think they realized they were being excluded from our attacks and wanted nothing we were dishing out. I verbally accepted their surrender while assisting Artemis in clearing the walls of the last of the archers. Gil returned from chasing the worg and reported that it got away. He was down to only his magic missile device, having used up the fireball combo device on the fort. Taking stock of the situation, we realized we had won! I talked with the leader of the lizardmen a bit. They had been contracted to help defend the fort by the goblins, not fight a war for them. When we bypassed them and kept our attacks on only the goblins, he (the lizardman leader) had decided that the contract was over. Respecting our obvious strength (and not knowing that we were about out of fight), we were granted an invitation to (a peaceful) visit to their city in the hills. We graciously accepted the invitation and sent them on their way. After they left, we got to talking with the last ettin, who was still sitting on the fort wall. Gil and Artemis spoke the giant tongue and translated what he said. He had noticed that every goblin who fled was attacked and killed and wanted to avoid that fate himself as he was heavily wounded. I was going to give him a healing potion and send him on his way when Gil suddenly attacked him with magic missile, killing the ettin in cold blood! This did not set well with any of us, particularly Arthus and The Hunter. The Hunter just stalked off without another word. Arthus and I demanded to know why Gilgamesh had killed the ettin. Gilgamesh’s only defense was, “He hit me with a javelin.” I believe Gilgamesh belatedly realized he had gone probably too far. If he had not been a reliable travelling companion up until that point, I think Arthus would have struck Gilgamesh down as a murderer right there and then and Artemis and I would probably have agreed with him. Not wanting to talk with Gilgamesh very much at that point, I turned to the goblin leader’s house. It was on fire, but it was still the best place to find the goblin’s treasure. I used elemental body to turn myself into a small fire elemental and went in and searched the structure. I was able to pull out a chest that was not burning, despite a burning log falling on it. This seemed promising. Artemis disabled the trap and unlocked it (with some minor assistance from me). Inside we found a set of very well made leather armor and a ring. Arthus had taken a ring and a headband off of the body of the goblin leader. We set these all together and had Gilgamesh check for magic and identify them. They were all magical [leather armor +2 of light fortification, headband of intellect +2, ring of water-walking, and a ring of jumping]. We were also pleasantly surprised to find that the pony was still alive and still had our chest (although the dart trap had been sprung at some point). After chasing it so long, Gilgamesh decided to name it Amy. With the sun setting, we made camp near (upwind of) the burning fort, fairly confident that nothing would attack us while the fort burned. It would have been almost pleasant if it were not for the smell of burning goblins when the wind shifted. Then it was wretched. We were undisturbed for most of the night. The red dragon flew around, very high up, during third watch, but made no effort to land or even get close. I think it was curious. The next day we made our way back to the waystation. It started raining heavily about mid-day and the red dragon flew by again near sunset, but we hid from it and it flew on. Due to the mid-day rain slowing us down, we had to camp in the debris field. On my watch I noticed a small boat in a debris pile. Curious as to what a boat was doing this far from water, I investigated. Inside was a dead body wearing a pristine cloak. I suspected the cloak was magical and took it off the body. The next morning Gilgamesh identified it as a cloak of the manta ray. Very puzzling item to find out here, but I am becoming less and less surprised by this place. After another hour we arrived at the waystation for a good long rest. This session happened Friday, October 15, 2010, and was the only session I ran this past weekend. This was Rhapsody's last game as the player is moving back to Ohio. The player and the character will be missed. Dedicated to clearing out the areas under "their" tower (especially now that they know they can defeat the morlocks easily), the adventures head out. The group makes their way to Drop-off Tower, the wizard and the sorcerer leading the way, using prestidigitation to plow through the snow. The only hitch is running across a dire boar snuffling around the road for edibles, but the group quickly turned the dire boar into edibles. Tasty, tasty edibles. At Drop-off Tower, the group showed Tycho and Agnes where the manticore treasure had been for two months. The group then rigged up a method for heating the tower for the night and they camped. The night passed with no sightings of wild animals. In the morning, the group descended into the "basement" and started re-exploring the area. They noticed that the fungus was growing back, but at no great speed. They went through the Pillar Room and the two secret rooms connected to it to the central corridor and discovered that this area was still blanketed with fungus. There was some discussion about killing the rust monsters, but it was decided that the rust monsters ability to eat away the fungus was most valuable, especially if they unchoked the stairs leading down in the Pool Room. The group backtracked through the secret rooms and around to the octagonal statue room [octagonal room with a statue, not the other way around] and found the passageway north covered with a urine-soaked, stretched-leather barrier. Not knowing why the morlocks had created the barrier (although Sal strongly suspected that the fungus was dangerous to the morlocks), they left it alone. The small portcullis east was raised and the group advanced east cautiously. Stopping at the Winch Room, they heard mumblings inside. Mog broke down the door to find six very surprised morlocks gambling with dice. The morlocks were quickly killed. Rhapsody picked up the wooden tokens (and the dice, a regular set and a loaded set) the morlocks were using as stakes, but could not determine what they represented. The group pushed on into morlock territory. They found signs of their previous combats (blood spilled on the floor – mostly adventurer blood) in the first room. They took the hallway north past the morlock latrine, discovering that the secret door to the morlock guard post would not open [it was spiked from the other side]. To avoid any unwanted surprises, the adventurers spike the door shut from this side and continued on, something they would regret later. They found a morlock sleeping area, which was empty, and followed the another hallway east. It eventual turned south to a T-intersection, with one branch leading to the guard room and the other down to some doors and around a corner, out of sight. The adventurers decided to clear out the guard room first and headed that way. Once again they were able to surprise the morlocks in the room, but were not able to quickly eliminate the morlocks this time. The fight with the 12 morlocks lasted a bit, long enough to draw attention from down the other branch of the T-intersection. Sal quickly cast a web spell and blocked the hallway behind the group, keeping the morlock reinforcements at bay. Once the morlock guards were dead, the group prepared to attack the reinforcements, but heard the reinforcements flee north. After a bit, Rhapsody was able to hear the reinforcements flee past the secret door, but, as the adventurers had spike the secret door from the other side, the fleeing reinforcements escaped. Rhapsody and Agnes quickly searched the guard room and then the adventurers gave pursuit [after Sal dispelled his web spell, of course]. They were able to follow the morlock tracks south, past a room the morlocks had ambushed out of last time the adventurers had been in this area, so the group slowed down and listened at the door. While doing so, Rhapsody noticed a secret door in the wall opposite. Not wanting to pursue the morlocks down a tunnel that went farther than any of them could see while there was a room to check, the adventurers opened the secret door and investigated the room beyond. What they found was a long hidden and long abandoned equipment room, untouched for over 200 years. Shelves of basic gear, heavily aged but not beyond the repair of a mend spell and several racks of elven [masterwork] longswords, including four that tested as magical. With smiles all around, the adventurers started packing the equipment as fast as Sal could mend it, rolling the swords up into restored blankets. The only potentially darkness in this scene is in two of the magic swords. One of the swords was unholy [+1], another anarchic [+1]. While an anarchic longsword was not too unexpected, why was there an unholy longsword in a clearly elven supply cache? While looting, er, securing the contents of the room, a secret trap door was noticed in one corner of the room. Underneath the trapdoor was a short ladder and a tunnel heading roughly northeast. To follow or not to follow? With their bag of holding bulging with the contents of the room, the adventurers decided it was time to return to the Iron Keep and see about converting some of the swords to coin. Flush with cash, most of the adventurers celebrated in style. Mog, on the other hand, paid off a few of his debts. Easy come, easy go. Hey, I've been sick, hence no regular Monday update. A Southern Reaches game did happen last Friday and SOME interesting things were found. That's all I'm saying right now. This session happened Wednesday, October 6, 2010. I missed the previous session due to illness and the adventurers had stopped at one of the I.C.E. waystations rather than return to Vestige, hence my abrupt trans-location. Four days after Gil, Artemis, Arthus, and Jonathan headed out (without me), I awoke to discover I was in a waystation, not back at the Gnome Hill Inn. Somehow I had been transported to the waystation the Artemis, Arthus, and Gilgamesh were in. This implies either a deeper link between I.C.E. and Gnome Hill or our I.C.E. tokens do a lot more than we were told. I’m not certain I like the implications of either solution. After a hearty breakfast, the others partially brought me up to date. They have been in all sorts of trouble, including nearly burning down an evil temple with a library and a failed attack on a goblin fort to retrieve Gil’s pony, which somehow got stolen by the goblins – I never got a complete or straight story about that. After telling me what they were willing to share, they asked my opinion as to which location we should return to. I decide to investigate the evil temple instead of attacking the goblin fort (I mean, really). After a half-day’s travel, we arrived at the underground remains of the temple. I was escorted through the chapel, where they fought animated skeletons to an area I refer to as the Rector’s Office. There is a desk and several shelves of books and the remains of an exploded armoire (Gil is bad luck when helping with traps apparently). After they showed me around the library, they showed me the trapped set of double doors, one of which had been set off, sealing the door shut permanently somehow. The other exit was a secret door leading to a room with a summoning circle permanently inscribed on the floor. That room also had a set of stairs leading down. The trick here was that both Arthus and Artemis had been teleported into the circle when they entered the room and been weakened when Gil tried to get them back out. To avoid this trap, we disassembled an adjacent set of shelves and knocked out a part of the wall separating the two rooms. Easy, really. The Summoning Chamber contained even more books, but these concentrated on summoning magics and other fell topics – we could not read most of them as they were in the fell languages of demons and devils. On a writing desk was some stationary and a quill. Inside a drawer of the desk was a jeweled coffer, an unflawed gem, and a bag of gold coins with twice the gold value of regular gold marks. Bribes or rewards? We took the stairs down to another room full of books, this time all index books covering the rest of the library. Each page indicated title, author, subject, location on the shelves, and had a short synopsis of the contents. We spent some time trying to decide which of these we would take for later referral, but we eventually gave up when we peaked into the next room – the main library chamber. A short aside here. So far, we had been through four rooms full of books. Back in Verden, I could parley this into a size-able amount of gold, but transferring the whole thing would take months if not a year or two. So I did my best to keep an eye out for noticeably valuable books and picked up a few on magic that caught my eye. If nothing else, I could read them later to see if they were really worth anything, and this I ended up doing later. The Main Library was a very large chamber with an impressive number of books, most of which weren’t very valuable. General topics of varying degrees of complexity. I didn’t bother trying to move any of them I was so unimpressed. Turned out to be a good thing, too. There was a valuable carpet in front of the main doors, which I rolled up to check for concealed trap doors (and so it would fit in my bag of holding – hey, it was treasure, alright?). The only impressive things were the stained glass main doors and some oddly placed mirrors on the walls. Thinking stained glass doors meant access to the surface, we opened them and went into the next chamber. We were wrong – the doors led to an underground cemetery. Not a crypt, mind you, a cemetery with grave markers and such. We checked the grave markers and they listed people by job description. The dates indicated that they had all died on the same day. The markings were obviously in the same hand as all the books in the catalog, suggesting the catalogist survived, but there was a grave for him as well, listing the same date of death. This was very odd. While searching the chamber, Artemis and I spotted a secret door over in one corner on the back wall. Opening it, we found a golden coffin, extremely similar to the one in the Mausoleum. Inserting Creation’s Key into a circular opening caused the coffin to light up under the effect of a daylight spell, illuminating the entire cavern. It also unlocked the coffin. Inside was a body holding a wooden box, just like in the Mausoleum. I carefully opened it, pulled out a white robe and a pair of gold glasses, and then reclosed the box and the coffin, which still glowed intensely. It was odd that this provided so much light in an underground chamber, which set my mind to thinking. I returned to the Main Library with Artemis and we closed the stained glass doors. The sunlight spell lit the doors, which also gave off six beams of light and projected an image where the carpet had been. Artemis and I followed the beams of light (some of which were reflected off the oddly placed mirrors), realizing they illuminated particular book titles and only certain words on those books. Writing them all down and sorting it out, we came up with a sentence: “Bring Light to the Locked Saltwater Grave”. Clearly a clue, but to what we have no idea. I re-rolled out the carpet and the image projected on the floor was two identifiable columns bracketing the symbol woven into the carpet, that of a book and sword, backed by a sun. I quickly sketched this out and we let Gil and Arthus back in as they had started complaining like small children about being locked out on the porch. I suggested Gil and Arthus re-check our findings in the Main Library and then borrowed Gil’s shovel. He had an idea of what I was about to do and started dragging Arthus around to look at things with Jonathan in tow. Artemis and I stepped back outside and closed the doors. We then stepped over to the catalogist’s grave and dug it up. How could a dead person bury everyone else and himself while leaving no traces? We were determined to find out. We uncovered the coffin and opened it. Inside was a body with a journal and a quill. I retrieved both and Artemis and I started reading the journal’s final entries. Apparently, the temple was a center of learning and the home of a monastic order. About five years ago, the place was attacked and sacked by evil forces and the catalogist survived by hiding in an armoire (the one Artemis blew up last time they were here). After the evil forces left, the catalogist buried all his brethren. But if he survived, who was actually buried here under his name and title and why? Neither Artemis nor I had an answer and we quickly re-buried the coffin, keeping the journal. Something is definitely up here. By the time we finished our digging (and cleaning up a bit), Gil and Arthus had confirmed our interpretation of what the lights meant. If Arthus noticed the dirt on Artemis and I, he gave no indication. Above the double doors was a balcony that seemed to lead back into the area we could not enter earlier. Using a grapple, we climbed up and investigated. There was a set of plain glass doors leading to an office of some sort, possibly of the head librarian. Inside was an ornate desk with two drawers, four dressing dummies wearing three sets of armor and a set of robes, and a large statue of a man in robes. Where there were double doors in the Library, this side only had one door and a blank wall. Apparently the trap, when triggered on a door, permanently seals the spot by magically placing a wall where the door should open. Artemis and I determined that the desk drawers were trapped, but the dress dummies were not. The armor and robes either tested as magical or were made of rare metals, so we quickly put them in the bag of holding for later identification. While moving them, we noticed a secret door on a side wall and decided to hold off on exploring that until we finished with this room. The traps on the desk drawers were very difficult to disarm, reset themselves, and were nigh deadly (luckily we had plenty of healing available). Convinced there were things of value in the desk, we persevered and eventually disarmed the traps and gained entry into the drawers. Inside the drawers we found treasure indeed, including another bag of holding, a belt of giant strength [+2], a circlet of persuasion, goggles of night, a hand of glory [a mummified human hand on a cord], a pouch of the double-value gold coins, and a very well locked book. We did not know all of this immediately, but when we camped later Gil was able to identify all but the book. Having finished exploring this room, we next checked the secret door. Behind it was a shallow but wide room containing five chests – the Treasury! Artemis and I took our time and thoroughly checked the room out. This was a good thing as all the chests were linked to a single trap that would have immolated anyone in the room and possibly the chests and their contents. These people were very serious about no one getting their belongings! Disabling the room trap, we had Arthus haul each chest out of the room individually to the balcony, where Artemis and I worked on them, one at a time. Each chest contained a large sack of coins and we filled out bags of holding with coinage of various denominations. At this point we were all tired and so we camped in this office. During the night, Gil claimed that the statue was watching him, but none of us saw anything of the kind. I spent much of my time on watch reading several magical theory books and reference books and I think I have some definite insights on things arcane now. Reading the magic was difficult and tedious, but I have learned much about the art of evocation. The next morning Gil identified all of the magical items we had accumulated the previous day and we were quite pleased with ourselves. Having completely explored this area, we decided to return to the waystation to prepare for our next goal – retrieval of Gil's pony and revenge on the goblins. We closed and locked the doors of this area on our way out (there are still a great many books that I wish to return and collect). By the end of the day we were back at the nearest waystation to rest and plan our assault of the goblin fort. The End of Verden - Soon! So my Wednesday night game is running into an issue - the DM just got a job out of state. Like, Ohio, so commuting is NOT an option. We have tonight's session and then next week's and then the campaign closes. This is a shame on two levels: 1) I get to play, as opposed to DM like I do in two other games, and 2) it's a darn fine campaign that has been an excellent foil for my Southern Reaches campaign. He does things differently and we are able to compare our games and learn from each other. I'll miss both of these things. Now I'm part of a group with four players and no DM. I'd rather not start yet another campaign just now. Two of the other players are new to RPGs, this being their first game and gaming group. The fourth is newer than me, but might step up (and he's possibly reading this, so consider it a hint). Other options are to track down a DM looking for players or switch to boardgaming. To track down another DM, I'll need to skip a Wednesday game and see if I can find some guys I gamed with once during the first season of D&D Encounters. They were not the group I started with, but, due to a switch in location and a car that was cranky, I played with these folks for an evening and had good fun. I deeply regret not getting any of their contact information that night. I don't want to post a general call as there are some folks I have no strong desire to sit at a table with again. The other issue with a new DM is a possible change in game system. For me this is a small issue as I'm willing to play several systems, but it might be a bit more frustrating for the newest players who are just getting up to speed on Pathfinder. All that said, I have notes for one Verden adventure log (cleaning out a hidden library) and will have notes for two more sessions (likely the assault of Fort Goblinton) and then Verden will be over. I'll have last week's session written up, uh, "soon". Traps pay out good experience points, especially the nail-biters. This session happened Friday, October 8, 2010, and was the only session I ran this past weekend. The session dragged a bit in my opinion, mostly because I was a bit tired after a long week without enough sleep. Still, the players learned something important near the end and have finally gotten over their dread of the morlocks. While several of the adventurers were sitting in Spider's Bar, Sal returned and asked what had happened while he was away. The adventurers regaled him with tales of what they had done and where they had been. When they got to the part where they had found a manticore lairing in Drop-off Tower and killed it, Sal asked a simple question that stopped the conversation cold: "What did it have for treasure?" The assembled adventurers realized that after killing the manticore, they had never searched the upper floors of the tower to see if the manticore had left any treasure. While they had emplaced the ballista on the third floor and nailed planking to limit access, they had never actually looked around, confining most of their activity to the first two floors of the tower. Suddenly motivated to re-examine the upper floors of the tower, the group set out, despite the bite in the chill winter and the snow it promised. Half way to Drop-off Tower, as they approached Jericho's Cairn, snow started falling from the slate gray skies. It increased in intensity over the next several hours. The group pushed on at a slower pace, making it to Drop-off Tower barely an hour before sunset. After entering the tower, familiarizing Sal with the tower's new security, and getting a fire started to keep warm, the group headed up to the third floor. Rhapsody took over the search. She looked into every corner of the third floor and found nothing. She then started up the spiral stairs up to the ruined fourth floor. Part way up, she found a pair of sacks tied together to form a rough set of saddle bags. Inside were 900 gold coins, a ring of protection +2, and a potent potion of levitation. After identification, Sal immediately claimed the ring of protection +2, swapping it with his ring of protection +1, which was passed to Mog after some discussion. The gold was split three ways amongst Su Bel, Rhapsody, and Thorngrim. The next morning, the group took the stairs down below the tower to their "back-door". When they opened the door, the hallways beyond were no longer covered in the thick carpet of violet fungus they were expecting. In fact, there was very little evidence that the fungus was ever there. This mystified those who had been down here before. They also realized that Tycho has the maps of this area and their memories were not up to the task of navigation. Thorngrim started mapping anew. The group headed forward, moving through the pillared hall. Sal remembered the secret door in this room and reopened it. On the other side was a mostly bare room containing a small collection of elf skeletons. After the group looked around a bit, they closed the secret door and continued past the pillared hall. Around a corner, they found two statue alcoves that were sealed off by oiled skins that smelled of urine. As they were determining why the alcoves were sealed off, Rhapsody heard the sounds of voices far down the hallway. As she made the other adventurers aware of the voices, she clearly heard a voice call out, "surface dwellers!" The adventurers quickly formed up, with Sal and Thorngrim casting enlarge upon Mog and Rhapsody. The two large adventurers advanced down the ten-foot wide hall, Mog in front, until they were able to see a large group of morlocks also forming up to do battle. The adventurers waited, prepared to receive the morlocks's charge. The morlocks advanced and the battle started. After a full minute of furious activity, the morlocks were all dead (along with four rust monsters the morlocks herded into the battle) and the adventurers were triumphant – a very different result from the last two encounters with the morlocks. The one worry was Mog's axe being hit by one of the rust monsters, heavily corroding it instantly. Mog was forced to switch to Sal's +1 longsword, which Mog considered inferior, but better than a wooden club. Not certain how they want to proceed at this point and with Mog no longer able to use his primary weapon, the group decided to return to the Iron Keep. They returned top-side (leaving the rust monsters in the pool room alone), locking and spiking doors behind them. They camped another night in chilly Drop-off Tower. In the morning, Sal cast mount four times and the group rode out, following the snow covered Gravemarker Road to the Keep, arriving at sundown. The next day, Sal tracked down a scroll of make whole and copied it into his spellbook. The day after that, he cast the spell on Mog's axe, returning the axe to pristine condition. While this was happening, Su Bel purchased a riding dog and turned it over to Thorngrim for attack training. I've been reading adventure logs on a few other blogs (notably A Character for Every Game) and I have gathered some good ideas for some pocket dungeons and possibly fleshing out a small chain of islands in Cold Bay, the waters west of Iron Keep (see the masthead for this blog). This is in addition to my ideas about pocket dungeons in the Iron Hills (the hills north of Iron Keep, where all the iron mines are). Time to put pen to paper and draw these out and populate them. Tangentially, I've been eyeing molskine pocket books at the local Broders, particularly the ones with gridded pages, perfect for drawing maps. They come in a variety of sizes, but are a bit pricy at a time I'm short on cash, so I've just been eyeballing them a lot, but not purchasing one. Then it occurred to me I own a) pads of letter-sized graph paper, b) a binding machine (the kind that uses the plastic combs), and c) scissors. So I cut a pad of graph paper in half, cut a plastic cover in half (creating a front and back cover), and recycled a digest sized comb from a TripTick my wife got from AAA. [TripTick are bound booklets available to AAA Plus members that provide maps and directions for trips in discrete chunks, like Google map instructions. They are very cool and handy, especially if you do not have a GPS device in your car.] Voila! My own digest-sized booklet of graph paper, perfect for mapping small dungeons and writing encounter descriptions. Better yet, it has 100 pages in it (instead of 64) and I can add or subtract pages at my leisure. Boo-yah! I've also realized I need to add more hostile NPCs to the campaign, preferably NPCs with class levels. The PCs are getting to the point where animal encounters are not worth the time to layout anymore (unless it's dire lions, then I can always find the time). It does mean that I can no longer be a lazy DM and just run things out of the Bestiary, but that's a price I'm willing to pay for cool encounters. Last Friday (October 1), the game did not make due to a lack of players (itself due to a variety of issues, mostly dealing with health). This is the second time in a span of a month, I was looking at only a cleric and a sorcerer being available. For most locations in the Southern Reaches, this equates to a a dead cleric and a dead sorcerer. As a result, I am taking two steps to correct this issue: open up the game to new players and create some adventure locales appropriate for two spellcasters. Opening the group up is both easy and difficult. Easy in that, ta-da – it’s done. Now I have to find local gamers to invite, gamers who play well with the existing group. This part is more difficult. The Houston metropolitan area is large (larger than the state of Rhode Island) and its gaming populace is scattered and not really in contact with each other as it has been years since Houston had a large stable gaming convention, something critical for putting gamers in contact with each other and, more importantly, allowing gamers to game with each other on neutral ground, rather than at someone’s home. This makes it easier to cut ties with/limit exposure to the crazies (and there are several of them, as a one time manager of a FLGS I met many of them). The pocket dungeons have to be small so two characters can reasonably handle everything in an evening. If it takes longer than that, they’ll fall back early and return with a troop of characters, completely overpowering what I originally put there and removing all challenge. These “side excursions” could even be used it to introduce hirelings (that could be recruited later as actual henchmen or cohorts) or start leveling secondary PCs (in case their primary PC dies). That’s it for now, more on pocket dungeons (or whatever seems more talkable) on Wednesday. OK, inserting the pictures into text didn't work as expected as the photos are ... large. So. I'm going to dump them here for the moment until I have more time to resize them for better presentation. CLICK THE PICTURES TO SEE THE WHOLE THING. My apologies for anyone's aggregator that explodes. My dad and step-mother renewed their wedding vows in Las Vegas this week and (thanks to parental financial assistance) I was there. Elvis was the officiant and a good time was had by all (which I think should tell you a lot about where I get my sense of humor). What I really want to talk about here is inspiring architecture. My wife and I were staying at the Riviera, which looks like any other hotel you've ever been to, but using a maze-like casino full of slot machines for the lobby. Really? Kind of boring. My dad and step-mother were staying in Cesar's - good lord that was awesome! The grounds outside are awesome, the the casino was awesome, the attached mall was really awesome, and the rooms were pretty cool. The mall architecture is what I really want to talk about, particularly the entrance from the street. The main area is open to the ceiling, encompassing three floors of mall and a false level above that. Doesn't sound awesome? Imagine that each floor is about two stories tall (except the top floor), the ceiling is an intricate mosaic, and the support pillars are three-story tall statues of Roman goddesses in a classical style. The floors are marble and there is a large fountain in the center. 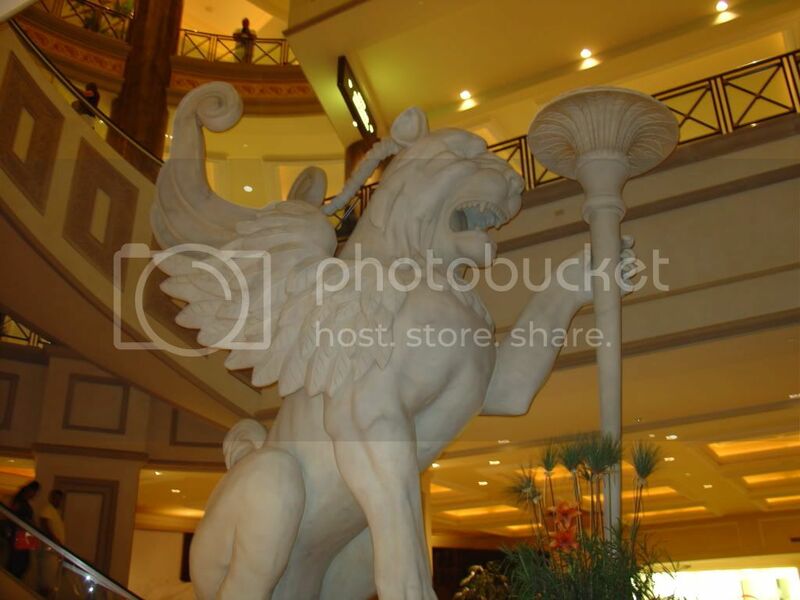 The curved escalators spiral up around a two story tall winged foo-dog. The whole thing shouted "Temple to The Gods" (if you selectively edit out the storefronts). This was a place adventure could happen. Once I've pulled the pictures from the camera I'll post some links so you can see what I mean. And this was just in the front area of the mall. Later on we passed a different set of fountains and statuary that was just as impressive (if not as large). Sadly, the data stick ran out of space here and I didn't get all the shots I wanted. Over in the Bellagio, they had seasonal displays, which were running an autumn theme. The effect was like an indoor garden full of over-sized vegetables (actual pumpkins the size of boulders figuring prominently). There was a pair of giant Venus fly traps that were animated to open and close their traps periodically. The effect was like a wizard's garden underground, lit by a sun that was either false or imaged from some other location (it was actually sunset at the time, which emphasized the underground feel, despite being at least two stories above the street level). 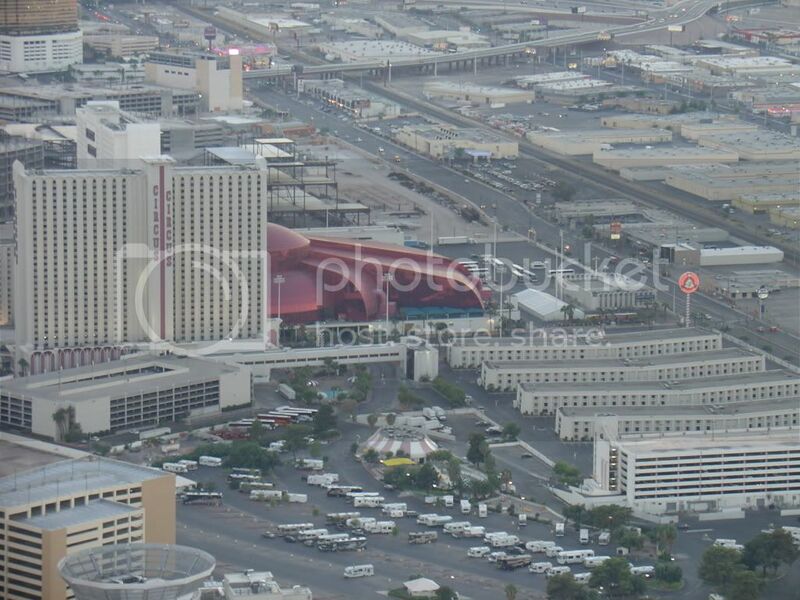 Another place that looks good on the outside was the Adventuredome, attached to Circus Circus. During the day it is this immense coppery dome structure, but at night they light it so it looks like red. From the north (from the Top of the World restaurant) it looks like some steampunk structure that has been partially unfolded (again, pictures to follow). If you want to inspire your players with wondrous locations, Vegas has places that make good models. Check out the architecture wherever you travel for good idea seeds, if not locations you can steal wholesale for use in your games. Imaging large and the players will love you for it and remember your campaigns fondly. Just, you know, make sure the PCs have things to do in addition to looking around. No one likes listening to a travelogue for 4+ hours.